Approximately 95 10th-graders in the International Baccalaureate (IB) Middle Years Program at KHS recently presented their Personal Projects to the Kokomo community during a showcase at the high school. Kokomo High School is a partner school with Central Middle International School in offering the IB Middle Years Program for grades 6 through 10, with the goal of developing Internationally minded students. The 2018 project topics included, Learning Calligraphy, Sustainable Farming, Learning the Ukulele, Globalization in Fashion, Creating a Vegetarian Cookbook, Making a Prototype of a Search and Rescue Robot, and Making Spray Paint Art, as well as many more. 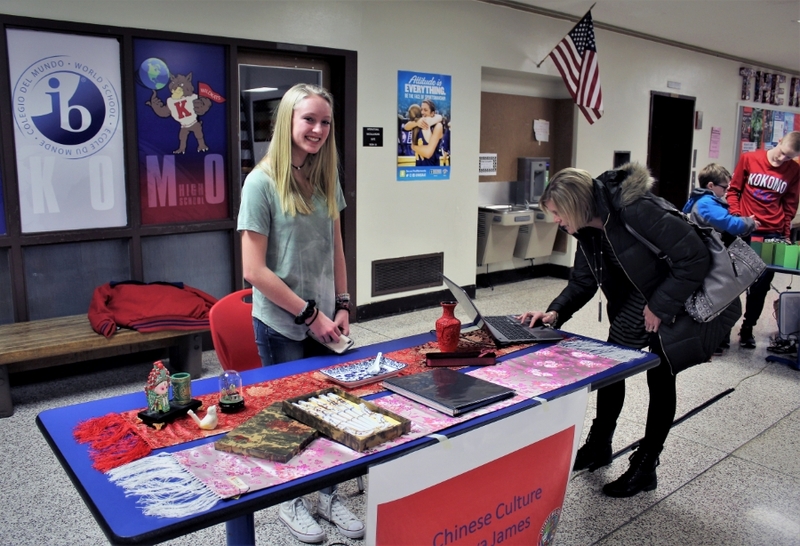 KHS sophomore Brayden York’s project, “Your Journey Awaits”, explored the importance of international travel in the IB program, and aimed to help others take part in such travel experiences. Brayden’s project involved developing a scholarship – the Melanie Peoples Memorial Travel Scholarship – to assist Kokomo School Corporation students interested in participating in one of the district’s exchange programs to countries such as Costa Rica, Chile, England, and China. Brayden organized a silent auction to raise money for the scholarship. This auction, which featured 15 items donated by local businesses and community members, took place during the Personal Project Showcase. Brayden had hoped to raise $500, through the auction and donations, but was amazed to learn he had raised $2,197 for the scholarship. In her project, Alexis described, from start to finish, what it takes to create a solo for a state competition. She showed the work that goes into a solo… from choreography, to costuming, to practicing, to re-blocking, and practicing again. Alexis spent five months working on her project. This time was spent gathering evidence – photos, videos, journals, etc. Central Middle International School teacher Mary Page served as a Project Supervisor for the personal projects, and enjoys being able to work with the students.